Werc was born in Ciudad Juarez, Ch. MX., and grew up in El Paso TX. Werc paints, collages and designs based on inspirations that come from urban & border culture, broad issues of labor, logos, symbols, and the nostalgic humor among immigrant cultures. He is specifically inspired by the creative informal economies of street vendors, and the archetypal language of design. In his paintings, he explores aspects of duality and the politics of identity, hunting and gathering documentation & found objects that later become part of his creations. Werc's murals can be seen around southern California, and throughout the United States and Mexico. His studio-based works have been exhibited in numerous galleries, the Snite Museum, Museum of Monterrey, and are part of the Cheech Marin Chicano Art Collection. 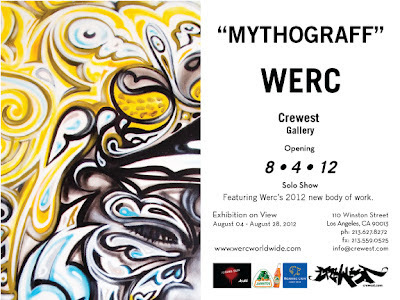 In August 2012, Werc will be presenting in the Crewest Main Gallery his very first LA solo show, MYTHOGRAFF. MYTHOGRAFF opens Saturday, August 4, 2012 and will be on view through August 28, 2012. For more info about this artist, visit WERC online by clicking here.